Trieste, 13th of May, 2018 - "I baptize you Luna Rossa!" - with these words the launch of the new TP52 was officially celebrated in Piazza Unita’ d’Italia in Trieste in front of thousands of people. 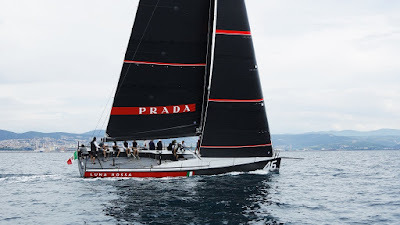 The city of Trieste enthusiastically welcomed the Luna Rossa Challenge team who will participate with this new yacht in the 52 Super Series, to take place from May to September this year. The TP52 Super Series is the first series of races in which the crew can test its strategies prior to the next edition of the America's Cup (Auckland 2021). Hosting the event was Mitja Gialuz, president of the yacht club of Barcola and Grignano and organizer of Barcolana, the largest sailing regatta in the world, who before the launch during the press conference at the Salone della Prefettura, said: "Luna Rossa Challenge faces a very important objective: before the America's Cup its mission will be to inspire all of our sports enthusiasts to excel and do their best ". Attending the meeting with Italian and international press were Patrizio Bertelli - Team Principal of Luna Rossa Challenge - and Max Sirena - Luna Rossa's Team Director and Skipper - who pointed out that among the goals of Luna Rossa there is the wish to promote sailing culture and to train new generations of sailors. This is the goal of the New Generation program, initiated this year with seven young acquisitions; this same goal has been behind the activities carried out during the days prior to the launch in the schools of Trieste. Attending the conference were also Gilberto Nobili, introducing the new projects of Luna Rossa and on-board technologies, and Francesco Bruni – helmsmen of the new TP52. A highly enthusiastic Vasco Vascotto was also called to comment his new participation in a campaign that will also include two young sailors also from Trieste: Andrea Tesei and Nicolas Brezzi. In his role as tactician Vascotto will participate in the next races and, alongside equally experienced sailors, will work with the younger athletes to initiate their a journey towards the America's Cup in the best way possible.